This Monday we have started our day in Usera district. We met in Usera Metro station at 10 h to start our trip. The aim of this first visit was to analyze the state of the public space that is included in the Plan Mad-Re. 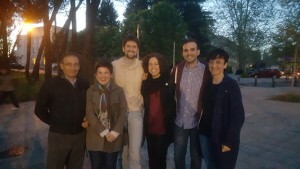 Alumni and coordinators starting the trip in from of Usera Market. As soon as we started our walk, we find this space in a little corner. The holes in the pavement due to some empty tree basins create risk to cause falls. 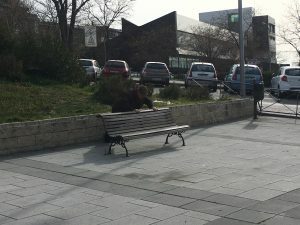 The banks, located in the beginning of the slope are not accessible enough for users, especially for the elderly. 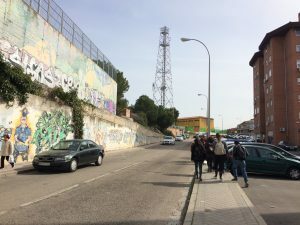 The view from this point is Madrid skyline, including the Colon tower, but the cars in front of this area make it not very attractive. 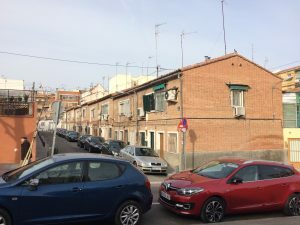 We also find interesting typologies in the middle of the neighborhood, reminiscence of ancient colonies of this district. We continue our walk across the streets. 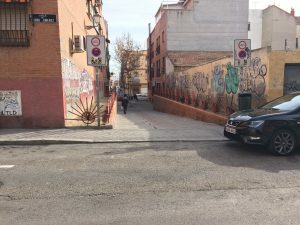 Narrow pavements, high slopes, dog poops, and cars and vans everywhere are some of the characteristics of these streets. 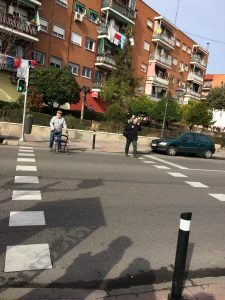 A very common situation we have found in the neighborhood is this kind of intersections, where the pedestrian needs to go further to look for a safe place to cross the street. In this case, Marcelo Usera with Mercedes Manjón street. It becomes a real challenge to cross the street. 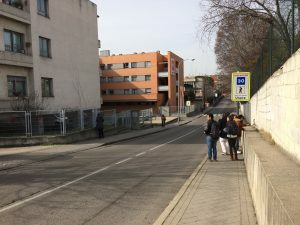 Even though there are only two road rails, the traffic density is too high that the streets have also fences to protect pedestrians and make it difficult to jump across. 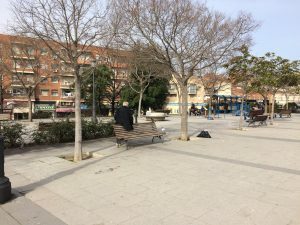 We arrive to Julián Marías Square. The fountain is dark green, with some garbage floating on it. The banks are not protected by trees so in the summer it has to be a very hard place to stay as the pavement is hard. The space seems very poor maintenance and quality. 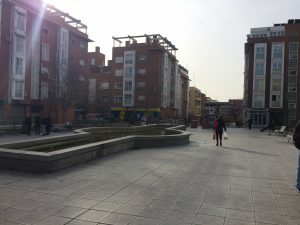 Juan Marías Square. The square lacks of vegetation due to the parking underground. 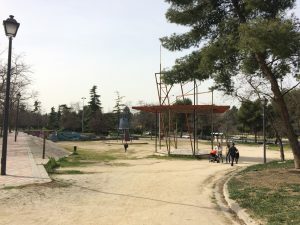 After Juan Marías Square we arrive to a bigger “green” area that continues the route and solves the height difference in a very particular way. There is no accessible path, even there are some ramps that try to solve somehow the situation. The ramp plane adapts to the slope of the ground instead of being flat. 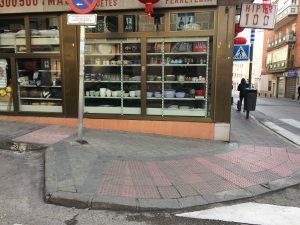 Not only would it be a challenge to pass through this path in wheelchair, for example, but it is also a challenge for everybody to walk on clean floor. 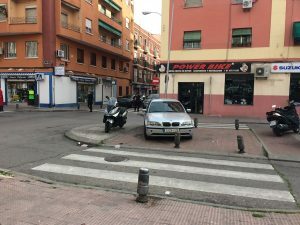 Cars have invaded pavements, even in places protected with bollards. Car placed in the middle of a pedestrian cross. Not only cars, but also some items are real obstacles in the streets. 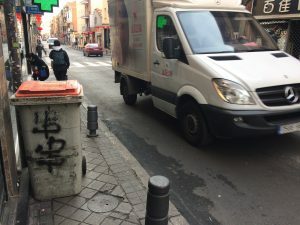 A garbage container in the middle of the street. 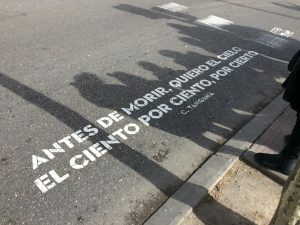 Other common situation is this solution for the pavement of the pedestrian crossings. 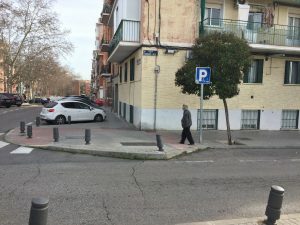 Although this normative has been recently updated, it is well known that the path should get the person to a vertical plane, so they can orient themselves in the street. The discontinuity between the podotactile pavement doesn’t solve the accessibility problems. Also the position of the signal in the middle of the way makes it a little bit difficult to pass through this sidewalk. We continue our route, visiting the surroundings of the elderly care centers of the neighbourhood. The district is well know by their migrant community, which is one of the strongest potentials. There is such an interesting cultural mixture in this community. This church has welcomed different cultures. Chinese mass is given in the morning, then Latinoamerican mass rituals are also organized during the week in combination with the local celebrations. 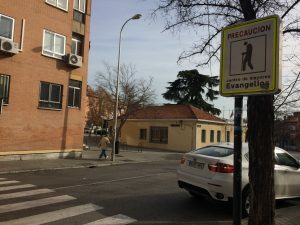 The access to the elderly center is not evident, and people tend to cross the road directly. In our route we continue to find the lack of accessibility in the neighborhood. In this pedestrian alley we can see the ramp without any rail for support. There are also abandoned plots in the middle of the urban tissue. This abandoned plots seem a garbage point as well as vandalism and graffiti. Between the cars, an old couple walks in the middle of the road. …and we understand soon why. Staying area, overcrowded by cars. 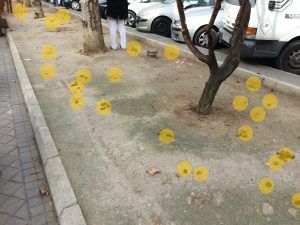 Dog poops create a continuos carpet in the only walkable space free of cars. The podotactile pavement ends in the parking, including steps. 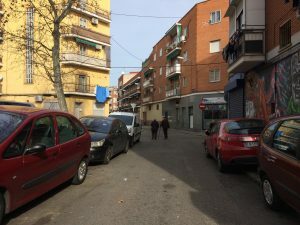 We continue the street until we get to Mariano Vela Street, where we can find the main equipments of the district, including another elderly care centre. Elderly people that go to the center could enjoy a better space to sit down and chat. In this equipment complex, we also find some little areas for elderly, such as machines for exercises. …or other ones that want to train all by themselves. Continuing our route to Pradolongo Park, we find some interesting spots such as Cinema Usera. 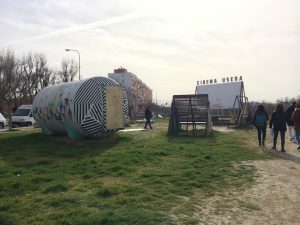 Cinema Usera remains in the park, a collaborative building workshop by TodoXlaPraxis and the Zofío neighbors. The limits with Pradolongo Park are full of cars and vans, as the rest of the public spaces. There are many vans in the public spaces of this district. This is also due to the existence of many garages and workshops installations. Pradolongo Park could be better connected by a clear and safe pedestrian cross, for example. We find another elderly care center as we go down Rafaela Ybarra Avenue. As the rest of the elderly care centers of the neighborhood, the access to this equipment is not evident for its users. Being old in this spaces supposes a daily challenge. In our way to the last elderly care centre, we find some street art that brings life to the walls of the street. 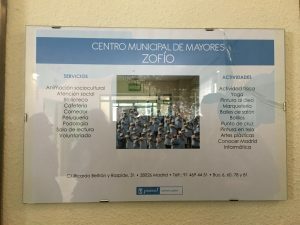 We also visited the Elderly Care Center Zofío. 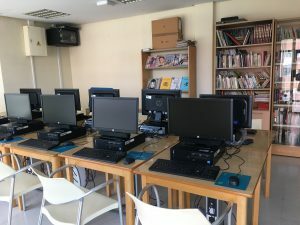 We were taken to visit all the installations and services of the center. There are between 4 – 6 people working there every day. Moreover, many of the activities are organized by volunteers. Services and activities that are offered in this elderly care center. The visit to the elderly care center, thanks to the support of Usera Public Social Services and the District Council of Usera. 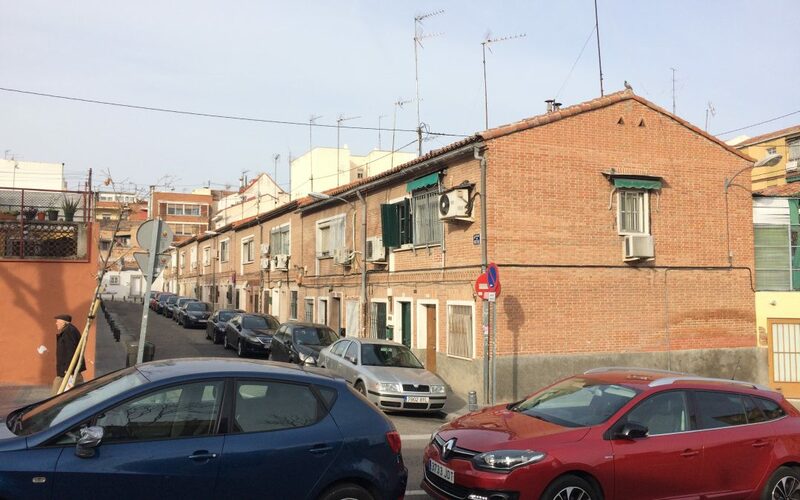 Back in the street, we finish our walk in the limits to the A-42 (Princesa de Austria Street). A complex of gardens and equipments are set in this part of the district, in order to reduce the noise and traffic pollution of the road. This area seems to attract many people, despite their location. The last tour around the district offers some important physical barriers that have been used as base walls for paintings. 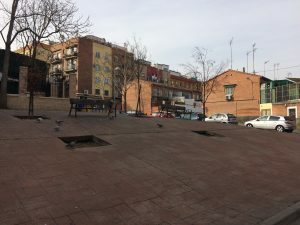 The closer we got to Plaza Elíptica, we started to see evidence of accessibility plans, renovation projects and the improvements both in housing and public space. 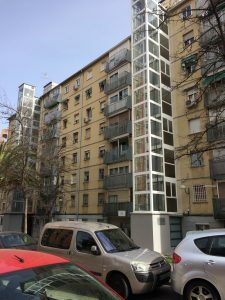 Installation of a lift in the exterior of the building in order to assure accessibility to all the floors. Paintings become art and not vandalism. 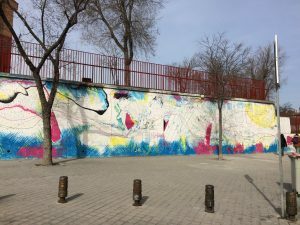 Madrid Art Project by Boamistura. 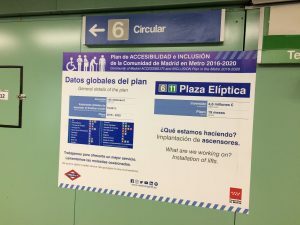 Accessibility plan for the underground station. This was the first visit to Usera district in the UNI-Health program and also for many of the students. We will come back for further analysis focusing in different topics such as air pollution, noise levels, accessibility or green areas. It has been indeed an interesting visit shared by UNI-Health group to have a first overview of the main problems of the district as well as the strengths and possitive characteristics. 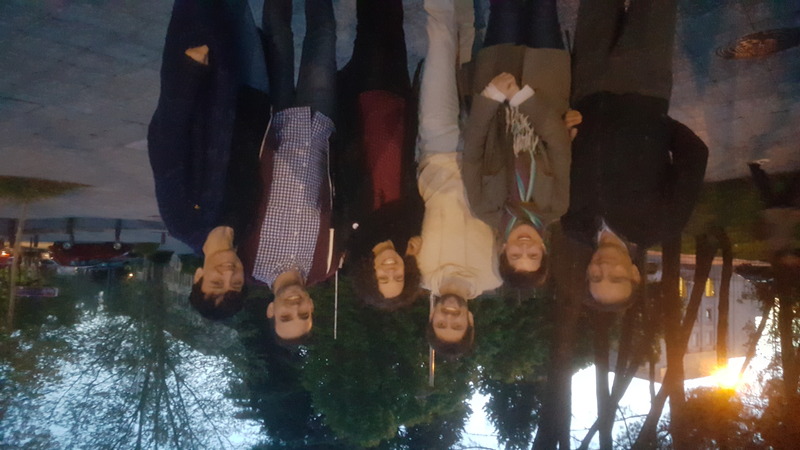 Next Monday we will have the special session with our guests from Newcastle University to share their expertise and experience about age-friendly spaces and active ageing policies and plans. 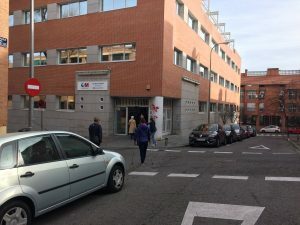 El grupo de investigación ABIO, desarrollará el proyecto de investigación FEMENMAD, enfocado en la cuantificación de los impactos sobre la salud que supone la pobreza energética en las mujeres. 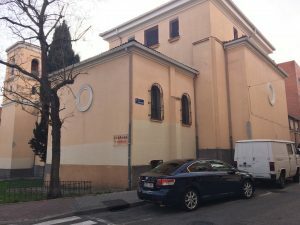 Este proyecto se enmarca dentro de la convocatoria pública de subvenciones que otorga el Ayuntamiento de Madrid para la realización de proyectos de investigación en materia de ciudadanía global y cooperación internacional para el desarrollo, que se resolvió elpasado 6 de noviembre del 2018. 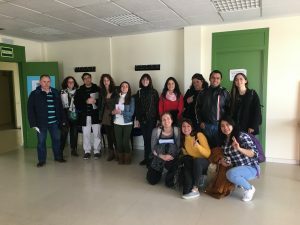 Gracias a esta iniciativa, permitirá revisar y actualizar, a través de un profúndo anlásis el fenómeno de la fenimización energética, cuyas consecuencias ya se plantean de forma somera en el informe “Estudio técnico sobre pobreza energética en la ciudad de Madrid” publicado por el Ayuntamiento en el 2016. 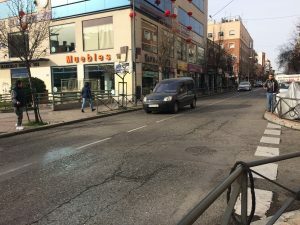 El miércoles 17 de febrero se llevó a cabo la tercera toma de datos de temperaturas de la ciudad de Madrid, cuyo objetivo es comprobar el estado actual de su isla de calor urbana tomando como referencia el estudio recogido en “El clima urbano de Madrid: la isla de calor” (López Gómez et al., 1988). 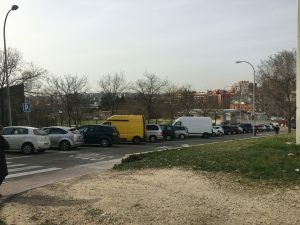 Su desarrollo consiste en unos recorridos transversales a la ciudad en un momento determinado del día y del año, mediante los cuales se consiguen medidas de temperaturas en diversos puntos de la ciudad. 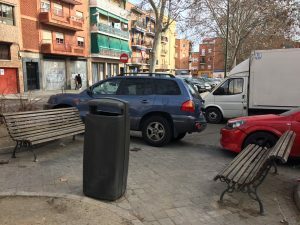 Los tres transectos se realizan en ambos sentidos de forma simultánea, en recorridos de ida y vuelta, y empleando coches equipados con sensores de temperatura. 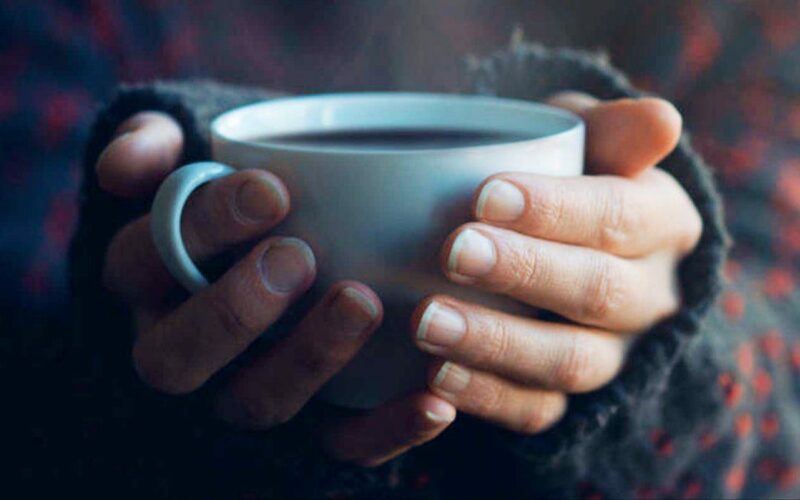 Dado que las temperaturas se mantuvieron atípicamente elevadas durante gran parte del invierno, hubo que esperar hasta la tercera semana de febrero para que se dieran las condiciones ambientales óptimas. 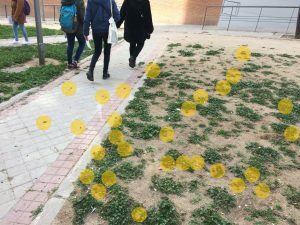 Así, los recorridos se llevaron a cabo en un día cuyas temperaturas se situaron entre 4ºC bajo cero y 9ºC de máxima, y cuyas condiciones sinópticas fueron de cielo despejado, ausencia de viento, y tiempo estable tanto en el día de la medición como en los anteriores. 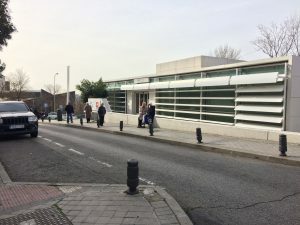 Las mediciones se llevaron a cabo al anochecer, comenzando a las 22:00 hora local (21:00 hora solar) y finalizando a las 00:00 hora local (23:00 hora solar). 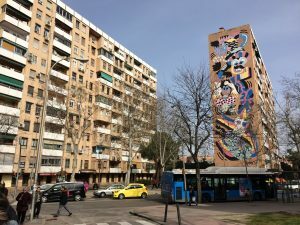 Como era de esperar , los registros de temperatura muestran diferencias de temperatura significativas entre los distintos puntos de la ciudad, llegando a ser de hasta 6ºC. -López Gómez, A., López Gómez, J., &Arroyo Llera, F. (1988). 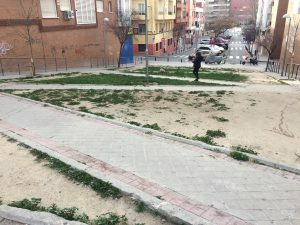 El Clima urbano de Madrid: La isla de calor. 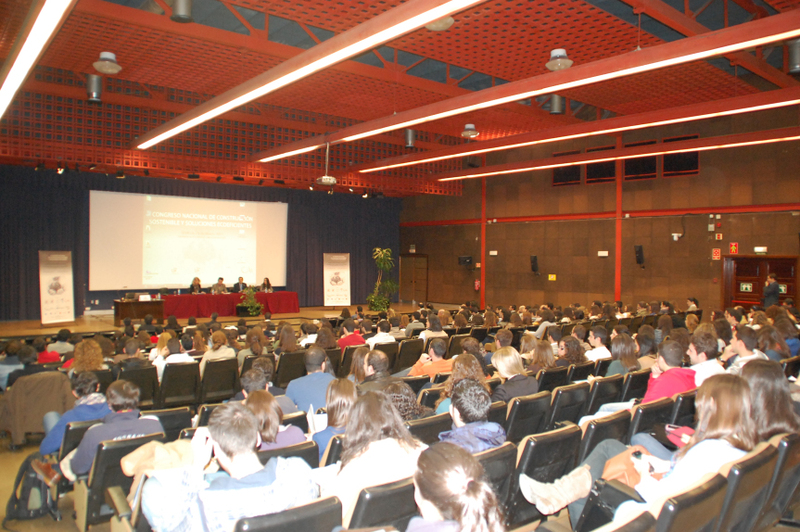 Madrid: CSIC. 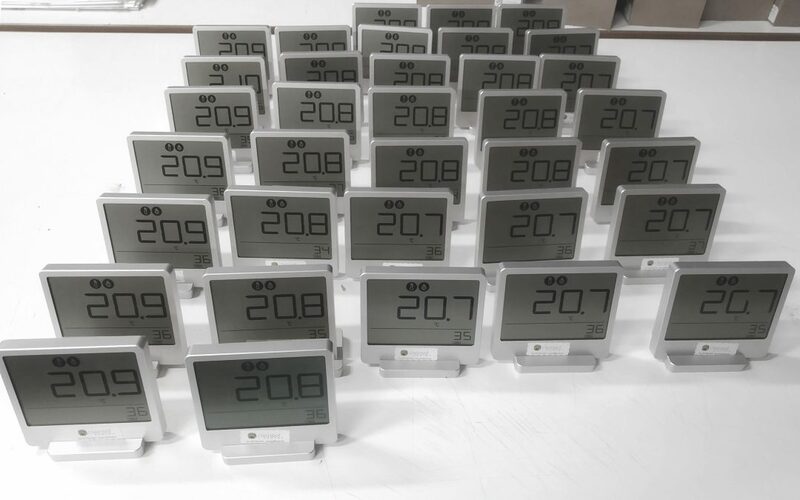 Despite great advances on building energy performance have been achieved during the last years, available climate data is derived from weather stations placed in the outskirts of the city. Hence, urban heat island effect is not considered in energy simulations, which implies an important lack of accuracy. Since 1980’s several international studies have been conducted on the urban heat island (UHI) phenomena, which modifies the atmospheric conditions of the urban centres due to urban agglomeration. In the particular case of Madrid, multiple maps haven been generated using different methodologies during the last two decades. These maps allow us to study the UHI phenomena from a wide perspective, offering however an static representation of it. 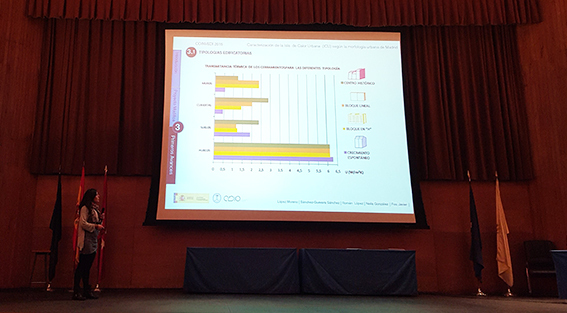 Consequently a dynamic model for Madrid UHI is proposed, in order to evaluate it in a continuous way, and to be able to integrate it in building energy simulations. The scope of our predictive model is defined by the structures that compose the city of Madrid. 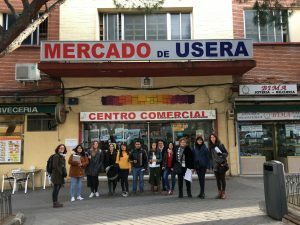 In particular, we focus on the homogeneous areas for urban structures with the same urban and building characteri the definition of such homogeneous areas were provided by previous research on the UHI of Madrid. The objective is to establish a critical analysis of climate records used for energy sim tools, which data come from weather stations placed in decontextualized areas from the usual urban reality, where the thermal conditions differs by up to 6ºC  intend to develop a new predictive model for the consumption depending on their location, the urban structure and the associated UHI energy rehabilitation interventions.